Champions: Derek Murray (coach), Paul Lally, Eddie Bennett, Sean Kilmartin, and Nathan Unorka from St Joseph's College, Galway - winners of the Lonergan Cup at the All Ireland schools’ championships. 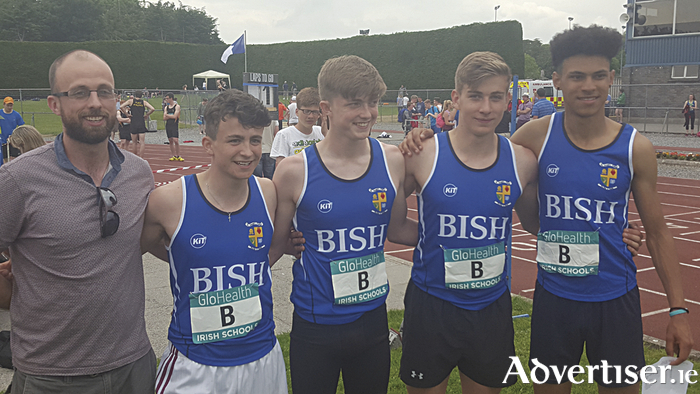 Forty years after St Joseph's ‘The Bish’ won the Lonergan Cup, the Galway school produced a storming finish to claim the title at this year's All Ireland Schools Track and Field Championships. In this centenary year of the schools' event, they became the first Connacht and Galway team to have won the intermediate 4 x 100m relay title since 1976 when a Bish team claimed gold. The first Irish schools athletics championships, due to take place in May 1916, were postponed because of the rebellion and were rescheduled for Saturday September 23, 1916, in Lansdowne Road. Since then the event has become an integral parts of the athletics calendar, and more than 300 schools from all over the country participated in the centenary event on Saturday in Tullamore. This year's team of Paul Lally, Eddie Bennett, Nathan Unorka and Sean Kilmartin, coached by Derek Murray and John Loughlin, saw off the challenges from favourites Bangor Grammar and St Mary's Dublin in a photo finish. The Bish were led off to a flying start by Paul Lally out of the blocks, with a good hand over to Eddie Bennett who ran a strong leg on the back straight. Nathan Unorka took up the baton and pushed really hard on the final bend with an excellent run to hand over to the final runner Sean Kilmartin. At this stage St Mary's Dublin had an unassailable lead and the Bish were positioned for a possible minor place. However, Sean Kilmartin produced a storming last leg and with every stride was catching the leaders, while close behind was Bangor Grammar school with sprint champion Aaron Sexton. In one of the most exciting finishes of the day, Sean Kilmartin dipped on the line for a photo finish, and after an agonising wait, the electronic timing identified the Bish as the winners by 100th of a second in a time of 44.89 seconds - a huge achievement for the school and the efforts of Loughlin and Murray who continue to promote schools athletics.